At this point, Blizzard could just raise the level cap, slap in a few new dungeons and quests and continue printing money. 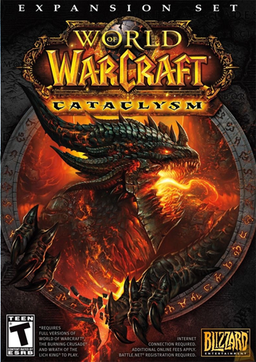 But that's not what they did with Cataclysm at all. The design team took a step back by modernizing the lands of Azeroth that players first leveled through all the way back in 2004. The team rewrote nearly every quest to mean something new in the world that was broken by the giant dragon Deathwing's emergence. Not only did the world of Azeroth get an overhaul to accommodate players' expectations to be able to ride their precious flying mounts in any new content, but the designers also revamped the stats and talents to make decisions simpler and more transparent for experienced players. That doesn't mean the content is cookie-cutter easy, as the difficulty of five-man dungeons has been retuned back to what it was in The Burning Crusade. Some may not like it, but success in what many forget is a multiplayer game actually means cooperating and communicating with other players again. To further entice players, Blizzard added new races to the Horde and Alliance that continue the ongoing story of Azeroth. Choosing to create a goblin allows you to play a diminutive profit-minded explosion expert with a Brooklyn accent, while roleplaying a human cursed to become a worgen surely satisfies anybody with an erudite werewolf fantasy. After the staples of elf, dwarf and orc, it's tough to create new fantasy races that don't feel ridiculous, but Blizzard somehow pulled it off by crafting excellently scripted opening sequences that feel like natural progressions of the lore instead of something tacked on to appease the fanboys. The MMO landscape was already dominated by World of Warcraft and Cataclysm proved that the designers are committed to improving both the game design and ongoing story of Azeroth. Beyond all that, it's almost more fun to see all the new things in the world than it was to discover them when we first logged in 2004. Any game that can still provide that feeling of adventure and discovery in a 6 year old engine deserves to be Game of the Year. Click here for the full written review and video supplement.